My ancestor's one-way journey from British India to Southeast Asia. 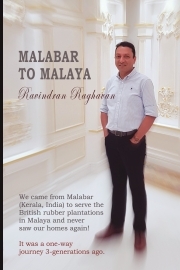 Description of "Malabar to Malaya"
I was born in a plantation house (not a hospital) and my birth certificate was "processed" in a police station. That is how I arrived earth in 1965. Grew up in the rubber plantation, soon to become unpaid underaged labour helping my parents tap rubber trees starting at 04:30 in the morning amongst the mosquitoes and snakes while smacking into spider webs between the trees.Our meals starts on a perfect dining table after pay day and dwindles into lack of food by end of the month. The vicious cycle seems to never end year after year. In the years to come I became a Chemical Engineer and that changed this "fate" by placing food on our table consistently. As I set sail on my career, my life took various positive turns that brought me to being a Company Director occasionally signing cheques with six digits in them. This book shares a part my journey that took me through pain, gain, glory and gratification. Author, 53 yeard old, is a third generation Malaysian of Indian descent. Graduated with a honours Degree in Chemical Engineering from University of Malaya (Kuala Lumpur) and held various management positions in multinational companies. Currently working as General Manager in the Dubai Head Office of a UK-based shipping company. Fluent in English, Bahasa Malaysia, Bahasa Indonesia, Tamil and Malayalam. Reviews of "Malabar to Malaya"